It would be irresponsible of a filmmaker endeavoring to present a fitting biography of Senator Kennedy to omit the death of Mary Jo Kopechne. 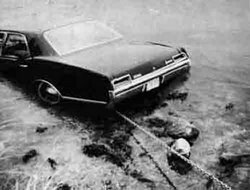 The word Chappaquiddick has taken on a sort of mystical quality among hard-core right-wingers in the United States, resulting in a call-and-response reaction for reactionaries. Ask your closest conservative acquaintance the first word that comes into his (or, who knows, her) head with the mention of Kennedy’s name. If Chappaquiddick doesn’t spring into the conversation in less time than Christopher Hitchens clutches a sherry glass, the subject’s bona fides should be in question. Teddy doesn’t linger on it, but chooses to proceed to the next set of difficulties. 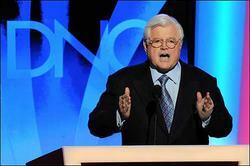 It isn’t a stretch to ruminate on whether Teddy Kennedy is the most fitting Job analogue our politics has available. If the film has missed a trial or a triumph, this reviewer can’t find it. There’s a moment in the film when Joan’s battle with alcohol comes up. The first thing that strikes the viewer is the seeming omission of Kennedy’s own legendary dipsomania. That nagging question is eventually addressed, as is virtually every twist and turn on Teddy’s road. If there is a missing piece to lament, it is the brevity of clips from his 1980 Convention speech. Among his trials and triumphs, that speech is what cements his legacy. It rings as true today as it did in 1980, and the speech in its entirety is compulsory supplemental viewing. Around this time, Kennedy was finding the dominant theme in his public policy career: health care. Like so much else involving him, the timing of this film falls right in the center of things shaping our future. At the moment, he seems poised for vindication on his battle of more than two decades. The victory will be worthy of Pyrrhus of Epirus, as the Obama Administration seems hell-bent on capitulating to the criminal syndicate that makes the American health care apparatus the Aunt Sally of the developed world. Teddy has taken on those recreants in the insurance industry. His fight has been noble if thwarted by his closest allies. Though the outcome is likely to be far from sufficient, Kennedy deserves great credit for working to keep this national shame in focus. It is quite imaginable that his crusade for adequate medical access among those who weren’t born into vast fortunes is the primary reason this woeful status quo is being challenged. How Teddy, and his brothers and sisters, arrived at such a profound understanding of noblesse oblige must be credited to his parents. The Kennedys weren’t the first limousine liberals, but they’re easily the most ubiquitous. It is perplexing to conceive of how a person from his class could empathize so completely with the lower orders; however he does it, it is without question that he does. In the end, the story of Edward M. Kennedy is one of ordeals and outcomes. Long languishing in his brothers’ shadows, he is deserving of the hero’s treatment this film bestows upon him. Ask anyone from the civil rights movement, the women’s rights movement, the anti-war movement, or any of a host of others that defined the Democratic Party before the Clinton Era. 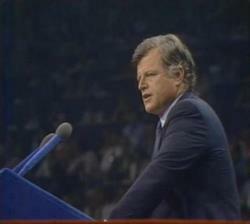 If the word hero doesn’t come up regarding Teddy Kennedy, it should. Given the torments he has endured in life, even the staunchest neocon blackshirt must agree that Kennedy meets every possible literary standard of heroism. Perfect? No. Neither was Hamlet or Henry or Huck. That Kennedy is imbued with an almost Falstaffian countenance must contribute to the universal respect he receives on the Hill. Teddy: In His Own Words allows the story to unfold and return to his moving moment in Denver. As the end loops the beginning to some of the bounteous footage provided in the film, it is clear that there’d be no other way to finish. After a barrage of images and events, after delivery of far too many eulogies for one man to bear, after accusations and innuendo, Teddy always comes back around. Back to Cape Cod, to his skiff and his water dog, to the ethics and ideals of Joseph, Rose, Joe, Jack, Bobby and Kathleen. Back to the fight for those left behind. Always back to the fight, because, as Teddy illustrates in perfect detail, if you can’t bring yourself to call him a hero, he will gladly settle on fighter. Where may I purchase this DVD??? It was a really good documentary. Is the Film `Teddy in his own Words` available in DVD! I have tried HBO and Amazon without success. Can you help me I am trying to get it for my sister in Ireland for her birthday in February. I too would like a copy of the DVD. How can I buy it? i would like to purchase this dvd for my bookstore-how would I go about ordering it?